One hundred years ago this month, twenty-six-year-old Albert Einstein published a paper entitled "Zur Elektrodynamik bewegter Körper" or "On the Electrodynamics of Moving Bodies". As we all know by now, 1905 was Einstein's annus mirabilis, the miraculous year in which he published four papers in the Annalen der Physik. The first was a paper on the photoelectric effect; the second on Brownian motion; and the third, which we have already mentioned, spelled out the ideas which would come to be known as special relativity. In case you are less than sure why Einstein's name has become a metonym for extreme intelligence, consider that there is broad consensus among physicists that any one of these three papers by itself would have been more than enough to win Einstein a Nobel Prize. The fourth paper, by the way, used the axioms of the third to derive a nice little result equating energy and mass: E = mc2, probably the most famous equation of all time. Not only that, he would certainly have won another Nobel for general relativity, which he published a decade later. In other words, you can safely think of Einstein as someone who, in a fairer world, would have been at least a four-time Nobel winner. As it is, the Nobel committee cited only the photoelectric effect when they awarded him the prize in 1921. Einstein's results were disseminated and understood so slowly (especially in the English-speaking world) that when Sir Arthur Eddington lead an expedition to prove general relativity correct by showing that the light from stars near the Sun in the sky would be bent by its gravity (during a solar eclipse in 1919 when you could actually see stars close to the Sun), and a journalist asked him: "Is it true that only three people in the world understand relativity?" Eddington reportedly responded, "Who's the third?" Now we have a problem. We have two irreconcilable laws: 1) The Principle of Relativity, and 2) The absoluteness of the speed of light for all observers. They cannot both be true. It would be another eighteen years before a young clerk in the Swiss patent office would pose and then resolve this problem. Here's how he did it: he asked what would happen if they were both true. Next, I will show how the various aspects of SR fall straight out of the assumption that both of these laws are true. I will focus in greater detail on the slowing down (dilation) of time, and then speak more briefly about length contraction, and the intertwining of space and time. Now, keeping these in mind, let us consider a simple mechanism that we will call a light clock (shown in Fig. 1). The way it works is this: the top and bottom surfaces are perfect mirrors. The distance between the top and bottom mirror is known exactly. The light clock's period is the time that it takes light to go from the bottom to the top, and then to come reflected back. Since the mirrors are perfect, light will keep on bouncing back and forth like this forever. All observers can build identical clocks with exactly the same distance between the two mirrors, ensuring the same period. And since the speed of light is always c, and the distance between the two mirrors can be measured precisely, we know exactly how long one "tick" or period of the clock is in seconds. 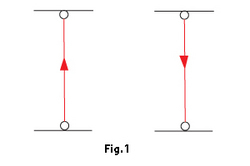 Since S's clock seems to be moving to F, it will seem to F that the light travels a longer path than just the vertical distance between the two mirrors, because after the light leaves the bottom mirror, the top mirror keeps moving to the right, and the light beam travels a diagonal path up to where the top mirror has moved to. (Imagine the whole apparatus moving to the right as the light beam goes up from the bottom mirror, or look at Fig. 2.) Since the speed of the light must still be measured as c by both observers, and according to F, the light beam is traveling a greater distance, it must be taking longer to make the trip to the top mirror and back. Therefore, according to F, S's clock is ticking more slowly, and vice versa! Someone might object that this is a special kind of clock, and maybe we could construct a different type of clock that would not slow down when seen speeding along relative to some other observer. This cannot be true. The reason is that if we were able to construct such a clock, it would violate our first postulate, the Principle of Relativity. Remember that in saying that only relative motion is physically significant, we are insisting that nothing done by S can tell her whether it is she who is moving past F, or vice versa. Suppose that two different types of clock were synchronized (one of them a light clock of the type we have been describing), then both of them are sent off with S at high speed, if they do not behave exactly the same way and were to fall out of synchronization, this would tell S that it is she who is really moving, and this contradicts the first postulate. All clocks must therefore slow down in the same way when they are observed in relative motion close to the speed of light. In other words, this time dilation is not a property of any particular type of clock, but of time itself. Since the speed of light is so high (186,000 miles per second or 300,000 kilometers per second), gamma is not significant at speeds that are common to our experience. For example, even at the speed which the space shuttles must attain to escape Earth's gravity (11 km/sec), gamma is 1.000000001. At fifty percent of the speed of light (0.5 c), gamma is 1.155. You can confirm these values by plugging in the speeds into the time dilation equation above. One way in which we know that Einstein was correct about time dilation is that particles with known half-lives decay much more slowly when they are accelerated to near the speed of light in particle accelerators. For example, muons, which have a half-life of 1.5 microseconds, are observed to decay in 44 microseconds on average in a CERN experiment which accelerated them to 0.9994 c, at which speed gamma can be calculated using the equation above to be 28.87. In perfect agreement with the theory, 1.5 microseconds multiplied by 28.87 comes out to 44 microseconds, exactly what is seen in the experiment. There are countless other very exact confirmations of relativistic time dilation effects. Now if this were all there is to the story, the amount of time dilation would depend on the orientation of the clock relative to the direction of motion, but then this would violate the Principle of Relativity. What prevents this violation is a shortening of lengths along the direction of motion. The distance between the two mirrors would thus contract by the factor 1/γ, reducing T'' to the correct value T' as it should be. So, lengths are observed to contract along the direction of motion by a factor of 1/γ. Again, this only becomes noticeable at very high speeds, approaching c.
Here, finally, is a quantity that is the same for both observers. It is not a measure of time or a measure of space; instead, it is a spacetime measure. So we find that in the end, though observers cannot agree about measures of space or time by themselves, it is possible to weave them together into a spacetime measure that everyone does agree on. This is what is meant when it is said that space and time have become interwoven after Einstein. The account I have followed in explaining special relativity is essentially that used by Richard Feynman (who invented light clocks as a way of explaining SR) and Julian Schwinger. The two of them shared the 1965 Nobel in physics with Sin-Itiro Tomonaga. Thanks to Margit Oberrauch for all the light clock illustrations.